Vic and I went to Victoria this past long weekend to do a bit of Christmas shopping (much easier without the kids) and to visit Vic's mom who lives in the Metro Vancouver area. - we stayed at the Magnolia. Loved the location and free breakfast. Nice smaller boutique hotel. - hearing Eleanor Wachtel speak. She is one of my favourite CBC radio hosts. We heard her at the Jewish synagogue in Victoria. - an interesting walking tour of Chinatown, followed by some amazing Dan dan mein (pork) at I Kyu Noodles Restaurant. Best. noodles. ever. 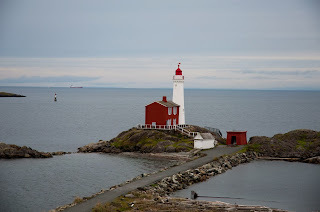 - a walk out to Fort Rodd Hill and Fisgard Lighthouse and then dinner later with Vic's friend Ted and his wife Norma.